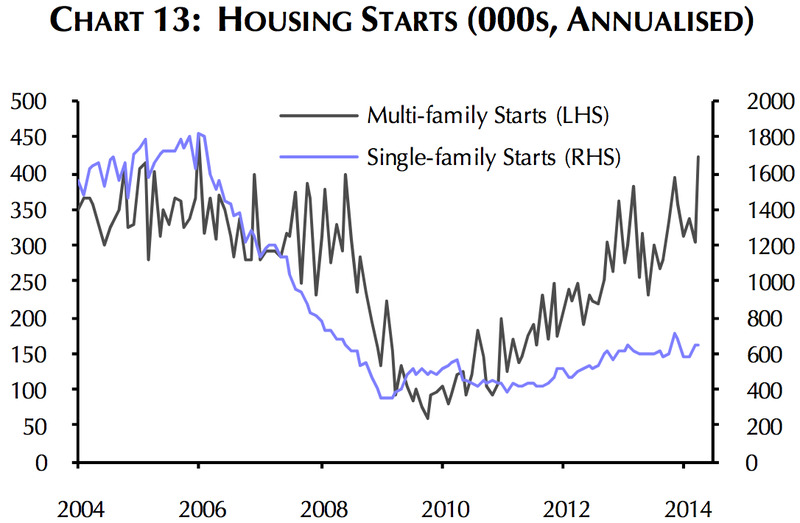 In this housing recovery, we’ve seen single-family home construction lag the boom in multi-family (apartment) building construction. This has been driven America’s shifting preference toward renting over buying. This of course has implications on the economy at large. “Building a new single-family home adds more to the economy than the recent alternatives of building apartments or remodeling,” writes Maury Harris at UBS. According to Harris, each single-family home adds about 3 jobs, and that is about 2.5 times the jobs that an apartment unit in a multi-family apartment building creates. 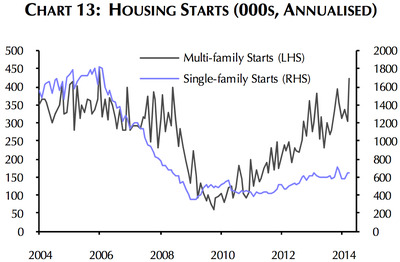 While the contribution is not nothing, the trend towards multifamily means fewer jobs will be created than if we were to see a stronger recovery in single-family starts.